But it is just then that we find ourselves facing a new difficulty. Once we come to recognize the need for a spiritual path we discover that spiritual teachings are by no means homogeneous and mutually compatible. When we browse through the shelves of humanity's spiritual heritage, both ancient and contemporary, we do not find a single tidy volume but a veritable bazaar of spiritual systems and disciplines each offering themselves to us as the highest, the fastest, the most powerful, or the most profound solution to our quest for the Ultimate. Confronted with this melange, we fall into confusion trying to size them up -- to decide which is truly liberative, a real solution to our needs, and which is a sidetrack beset with hidden flaws. One approach to resolving this problem that is popular today is the eclectic one: to pick and choose from the various traditions whatever seems amenable to our needs, welding together different practices and techniques into a synthetic whole that is personally satisfying. 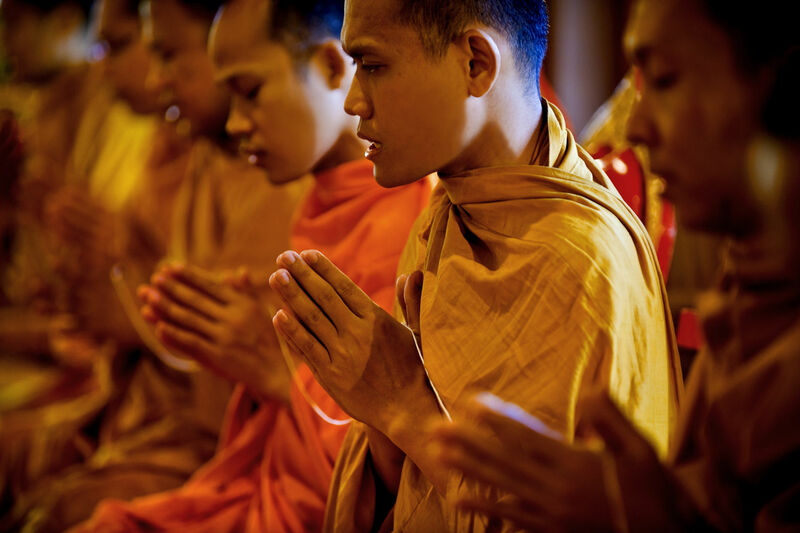 Thus one may combine Buddhist mindfulness meditation with sessions of Hindu mantra recitation, Christian prayer with Sufi dancing, Jewish Kabbala with Tibetan visualization exercises. Eclecticism, however, though sometimes helpful in making a transition from a predominantly worldly and materialistic way of life to one that takes on a spiritual hue, eventually wears thin. While it makes a comfortable halfway house, it is not comfortable as a final vehicle. There are two interrelated flaws in eclecticism that account for its ultimate inadequacy. One is that eclecticism compromises the very traditions it draws upon. The great spiritual traditions themselves do not propose their disciplines as independent techniques that may be excised from their setting and freely recombined to enhance the felt quality of our lives. They present them, rather, as parts of an integral whole, of a coherent vision regarding the fundamental nature of reality and the final goal of the spiritual quest. A spiritual tradition is not a shallow stream in which one can wet one's feet and then beat a quick retreat to the shore. It is a mighty, tumultuous river which would rush through the entire landscape of one's life, and if one truly wishes to travel on it, one must be courageous enough to launch one's boat and head out for the depths. The second defect in eclecticism follows from the first. As spiritual practices are built upon visions regarding the nature of reality and the final good, these visions are not mutually compatible. When we honestly examine the teachings of these traditions, we will find that major differences in perspective reveal themselves to our sight, differences which cannot be easily dismissed as alternative ways of saying the same thing. Rather, they point to very different experiences constituting the supreme goal and the path that must be trodden to reach that goal. Hence, because of the differences in perspectives and practices that the different spiritual traditions propose, once we decide that we have outgrown eclecticism and feel that we are ready to make a serious commitment to one particular path, we find ourselves confronted with the challenge of choosing a path that will lead us to true enlightenment and liberation. One cue to resolving this dilemma is to clarify to ourselves our fundamental aim, to determine what we seek in a genuinely liberative path. If we reflect carefully, it will become clear that the prime requirement is a way to the end of suffering. All problems ultimately can be reduced to the problem of suffering; thus what we need is a way that will end this problem finally and completely. Both these qualifying words are important. The path has to lead to a complete end of suffering, to an end of suffering in all its forms, and to a final end of suffering, to bring suffering to an irreversible stop. But here we run up against another question. How are we to find such a path -- a path which has the capacity to lead us to the full and final end of suffering? Until we actually follow a path to its goal we cannot know with certainty where it leads, and in order to follow a path to its goal we must place complete trust in the efficacy of the path. The pursuit of a spiritual path is not like selecting a new suit of clothes. To select a new suit one need only try on a number of suits, inspect oneself in the mirror, and select the suit in which one appears most attractive. The choice of a spiritual path is closer to marriage: one wants a partner for life, one whose companionship will prove as trustworthy and durable as the pole star in the night sky. Faced with this new dilemma, we may think that we have reached a dead end and conclude that we have nothing to guide us but personal inclination, if not a flip of the coin. However, our selection need not be as blind and uninformed as we imagine, for we do have a guideline to help us. Since spiritual paths are generally presented in the framework of a total teaching, we can evaluate the effectiveness of any particular path by investigating the teaching which expounds it. First, the teaching has to give a full and accurate picture of the range of suffering. If the picture of suffering it gives is incomplete or defective, then the path it sets forth will most likely be flawed, unable to yield a satisfactory solution. Just as an ailing patient needs a doctor who can make a full and correct diagnosis of his illness, so in seeking release from suffering we need a teaching that presents a reliable account of our condition. The second criterion calls for a correct analysis of the causes giving rise to suffering. The teaching cannot stop with a survey of the outward symptoms. It has to penetrate beneath the symptoms to the level of causes, and to describe those causes accurately. If a teaching makes a faulty causal analysis, there is little likelihood that its treatment will succeed. The third criterion pertains directly to the path itself. It stipulates that the path which the teaching offers has to remove suffering at its source. This means it must provide a method to cut off suffering by eradicating its causes. If it fails to bring about this root-level solution, its value is ultimately nil. The path it prescribes might help to remove symptoms and make us feel that all is well; but one afflicted with a fatal disease cannot afford to settle for cosmetic surgery when below the surface the cause of his malady continues to thrive. To sum up, we find three requirements for a teaching proposing to offer a true path to the end of suffering: first, it has to set forth a full and accurate picture of the range of suffering; second, it must present a correct analysis of the causes of suffering; and third, it must give us the means to eradicate the causes of suffering. This is not the place to evaluate the various spiritual disciplines in terms of these criteria. Our concern is only with the Dhamma, the teaching of the Buddha, and with the solution this teaching offers to the problem of suffering. That the teaching should be relevant to this problem is evident from its very nature; for it is formulated, not as a set of doctrines about the origin and end of things commanding belief, but as a message of deliverance from suffering claiming to be verifiable in our own experience. Along with that message there comes a method of practice, a way leading to the end of suffering. This way is the Noble Eightfold Path (ariya atthangika magga). The Eightfold Path stands at the very heart of the Buddha's teaching. It was the discovery of the path that gave the Buddha's own enlightenment a universal significance and elevated him from the status of a wise and benevolent sage to that of a world teacher. To his own disciples he was pre-eminently "the arouser of the path unarisen before, the producer of the path not produced before, the declarer of the path not declared before, the knower of the path, the seer of the path, the guide along the path" (MN 108). And he himself invites the seeker with the promise and challenge: "You yourselves must strive. The Buddhas are only teachers. The meditative ones who practise the path are released from the bonds of evil" (Dhp. v. 276).